Patience is a virtue, never truer than when one is waiting for the mail. Practice your patience by stitching this rustic mailbox, add a little snail, and complete a garden of heirloom flowers – the hollyhock, clematis, ruffled petunia and Rosalie’s original MilleFlower. With the new picotee butterfly, you’ll find three different ideas that can be used anywhere. --and of course, there’s a little kitten hidden among the flowers, also waiting patiently! When you have finished and framed your design, attach cup hooks at either the bottom or lower front of the frame, hang the finished piece next to your front door and you’ll be ready to collect your snail mail as soon as it is delivered. 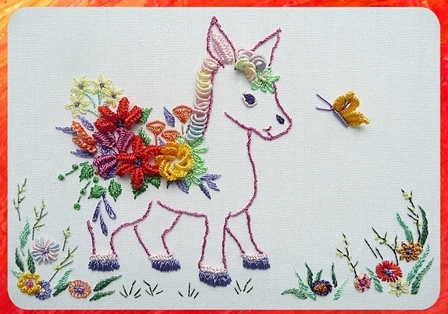 The kitten is stitched with an easy version of thread painting. Rosalie’s picot cast-on stitch adapts itself to an original picotee butterfly on this design and you’ll learn how to fill the center space in a looping lazy daisy as well as the fly-stitch/bullion tack combo for the antennae and body. An interesting idea for sttiching realistic hollyhocks is presented, and delightfully simple needleweaving is used for the clematis. 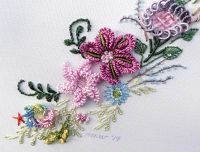 You’ll finish your embroidery by stitching ruffled petunias, the MIlleFlower, and a little snail (made with either a bullion rose variation or a little snail charm or bead). 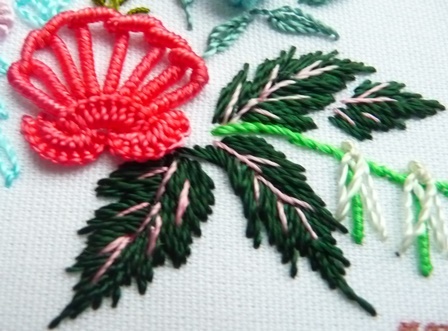 Depending on stitch placement, the same trio of stitches creates three entirely different focal flowers - the Stella d’Oro daylily, Pinwheel, and the Stop Anytime. 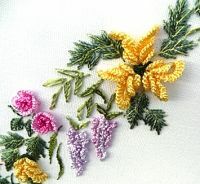 A new technique for creating wisteria blossoms will delight you with its simplicity, and you’ll enjoy stitching the new Mexicali rose, as well as harlequin roses, delicate little sweetheart roses, daisies, little barbies and more. It’s like playing in your own private garden! The Brazilian Dimensional Embroidery International Guild's Flower of the Year for 2014 brings us Daisy. Daisy is a little burrito. She wears ruffled bobby socks and purple patent leather shoes. She has daisies in her hair and a colorful mane. --and she gathers a festive burro bouquet. Her flower collection begins with a Mexicali Rose made with another variation of Rosalie’s “Comma”, the Mexican Sunflower, Margarita Daisies, Salsa Cups, Burrito Blossoms and little Taco Bells stitched with Rosalie’s original woven picot bullion and cast-on pistil stitches. The Picotee butterfly enchants Daisy with its new version of the picot cast-on that introduces a new idea for filling the space in a looping cast-on, plus the combination fly-stitch/bullion for body and antennae. 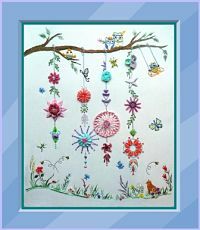 If you enjoyed stitching Millefiori design #999 "TooT", you will have just as much fun with our little Daisy. 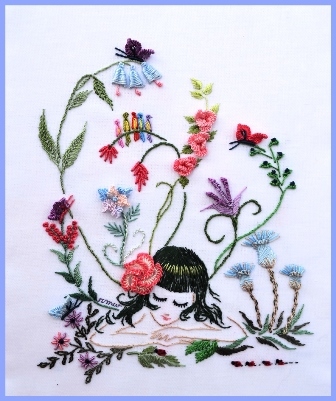 As she daydreams and watches the progress of a ladybug family, this young girl finds her dreams filled with flowers: a plumeria in her hair, michelmas daisies, fizzy stick flowers, Rosalie Wakefield’s picot rose, scarlet paintbrush, twinkle bells, little rosey posey, fan lily, blue-eyed peas and bachelors buttons. 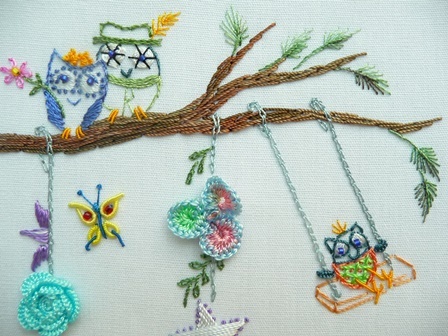 Choose Iris or Frost to go with Glory to stitch the new Picotee butterflies and lazy daisy birdies perched on an overhead flower stem as they sing her daydreams. 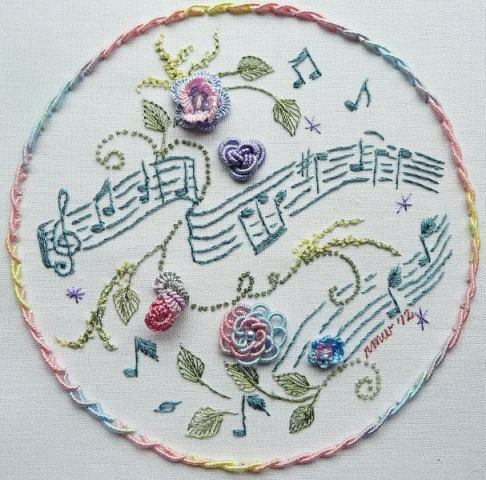 This delightful little Brazilian embroidery design is the size of a CD. It can be finished as an ornament, backed with a second CD, or it would make a lovely cover design for an iPad, reader or jewelry box. 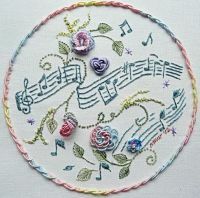 You’ll dance your way through some floral delights – the Interlude Rose, Three to Tango (a variation of the Bossa Nova), the Can-Can (a new technique with naughty ruffles), Vienna Rose (made with spiral lace), Staccato (a brand new drizzle), Fox (Trot) Grass, and the Hokey Pokey – all versatile, lighter-floss-weight flowers that can be stitched anywhere. When you name a design “South of the Border”, your color choices are endless - vivid, pastel, lively, muted - and you can truly make this design your own by selecting a favorite color palette. If you like the challenge of learning new flowers, there are lots of new flower techniques here and a different leaf to go with each. The lacelike chiffon lilies are stitched with a variation of my “Archie drizzle” technique and stamens are added with the new cast-on pistil stitch. 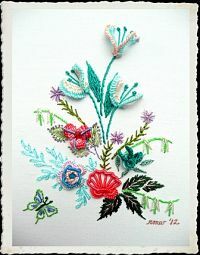 The fan flower is made with a bullion-woven buttonhole stitch, the colors quietly echoed in its leaf veins. Amazon asters sway in the gentle southern breeze, and you'll stitch the lollipop lily, Argentine weeping lilies and the rain lily – all with new techniques that can be used on other designs. The teacup flower collects cast-on stitches and bullions together, so you can have your afternoon "cuppa" right here among the flowers. 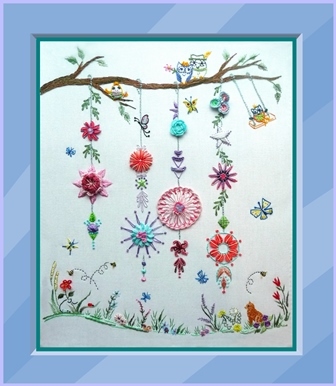 Breeze through this Brazilian embroidery design and finish it as a small art quilt or pillow – wind chimes gently singing in the wind, each flower ready for stitching on any other design. Swaying to the music is a family of owls – mom and dad ready to step out onto the dance floor (or in this case a tree branch), a young teenage owl listening to her own music on her smart phone, and a young swinging owl on a swing, just swinging. 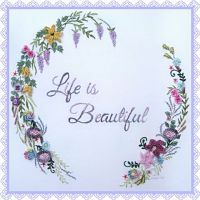 Butterflies and Glory Be! s dance in the sky and a garden filled with flowers, weeds and grounded creatures – can you find them? – a mouse, ladybug, snail and kitten - just enjoy themselves. 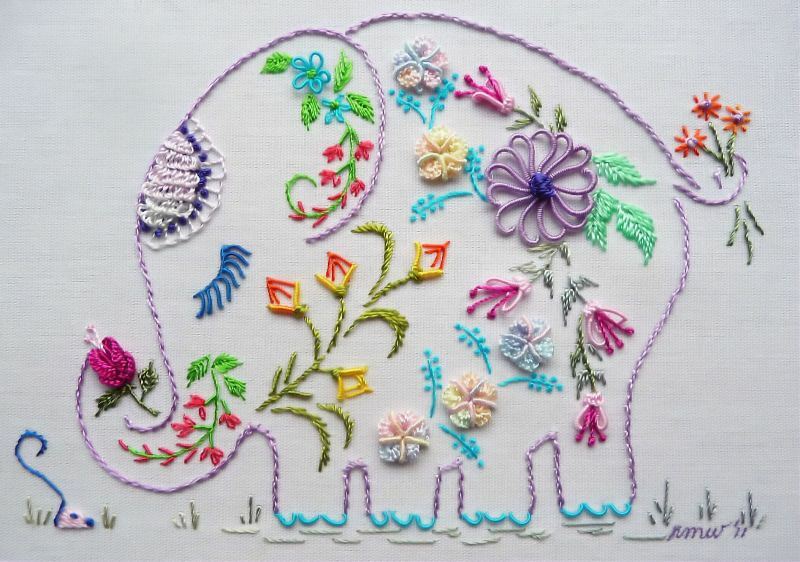 You’ll have so much fun stitching the wildlife that you might forget the flowers, but don’t! They are the best part – different techniques on each of the garden flowers, and each wind chime featuring a variety of stitch combinations. 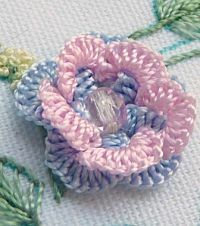 Some stitches are the chain stitch, detached buttonhole stem stitch, knotted loop, Little Archie, lollipop, lopsided lazy daisy, needle weaving (three different ideas),new cast-on pistil stitch, reverse colonial knot, reverse lazy daisy, satin stitch with Lola, side fly, star-fill and the comma. Beautiful botanical gardens are found throughout the world. Native plants and flowers of the Pacific Northwest inspire “Crystal Springs”, a tribute to one of Oregon’s many lovely gardens. Waterfalls and a spring-fed lake provide habitat for waterfowl as visitors stroll along garden paths, enjoying the spectacular rhododendrons and azaleas that bloom from March through June. A great blue heron, “Portland’s Official Bird” wades in shallow waters, drawing visitors through the garden to admire floral treasures of nature. Dragonflies flutter by at “beak level” hiding behind a lovely camellia and ridged blanket stitch ferns. 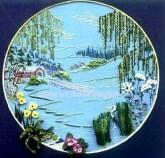 Stitchers will learn the new “Lollipop Stitch” to make water hyacinths. Catkins in the red alder trees are also stitched with an interesting new technique. 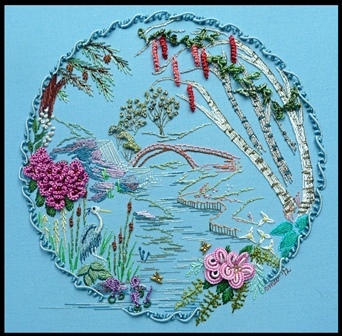 You'll stitch realistic alder or birch tree trunks and branches, adding foliage with the original continuous drizzle. Realistic waterfalls and streams, rocks and other natural elements are included. 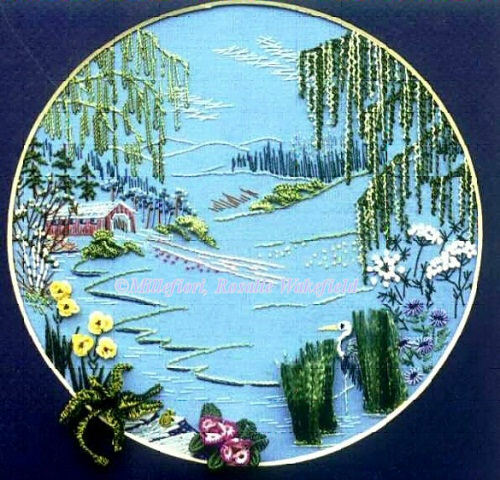 Crystal Springs also includes the lovely mountain laurel, Douglas fir tree, hosta and a native wildflower, the trillium, all encircled by the String of Pearls border made with bullions and the reverse colonial knot. Two companion prints are available for this design -- Millefiori design #817 "The Waterlilies of Claude Monet" and #842 "Covered Bridge". 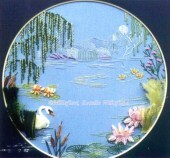 Design: 8” circular on 15” x 15” fabric, medium blue only. 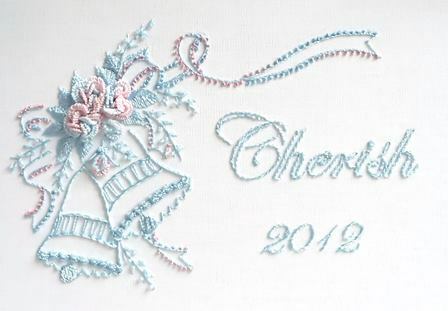 Stem and outline stitch are used to create the bell, ribbon and letters. 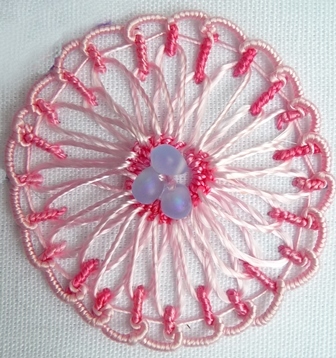 The edge of the bell is stitched with cast-on stitches, a tiny bead nestled within each. 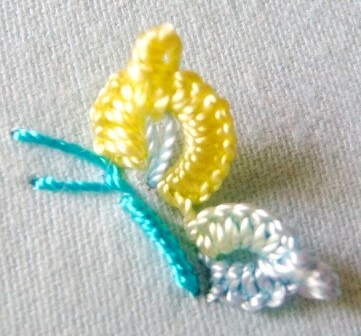 Buds are made with cast-on stitches and a loop of beads for added sparkle. 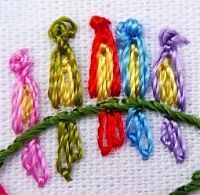 The ribbon is stitched with Glory and edged with the Reverse Colonial Knot (my preferred substitute for a French knot) - instructions included. 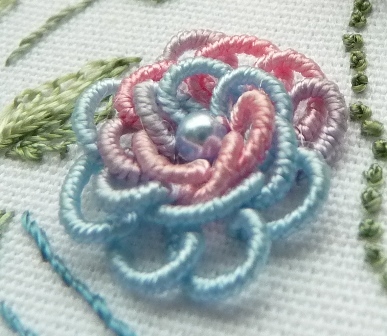 The flowers at the top of the bell are made with a variation of my original stitch technique, the Canada’s Rose. 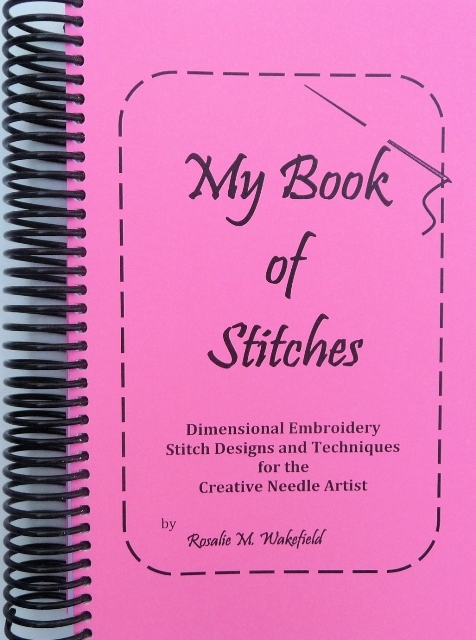 Developed from over 200 Millefiori embroidery designs and more than seven of Rosalie Wakefield’s books on Brazilian embroidery, including Take A Stitch, a new spin is now added to familiar stitches as hundreds of innovative ideas fill the pages in My Book of Stitches. 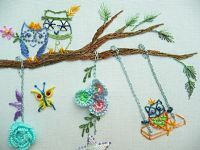 This collection of dimensional embroidery ideas is meant to inspire other stitchers toward designing and creativity and may be used on any project – crazy quilts, wearable items or needlework for the home. 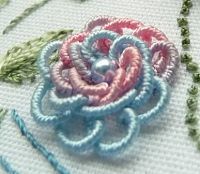 Visit my blog at http://rosaliewakefield-millefiori.blogspot.com/ Patterns to use with some of the flowers and stitches will be posted periodically.